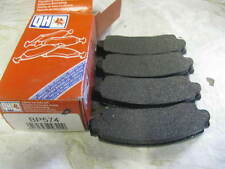 POWERTRAIN PBDF780 BRAKE PADS. Part No : PBDF780. Nissan Sunny 1.6 B12 GTi Coupe 16v 5/87-5/89. Nissan Sunny 1.6 N13 GTi H/back 16v 6/87-5/89. Nissan Sunny 1.8 N13 GTi H/back 16v 1/89-5/91. Suzuki Swift 1.3 AA35 4/92-7/96. Nissan Sunny 1.6 GTi B12 N13 1987-1991. 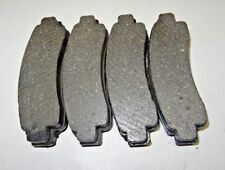 EBC DP 682 Nissan Sunny (1986-1992) Kevlar Brake Pad Set Rear L/R. NISSAN Sunny 1.6 Gti (N13) 86-92. NISSAN Sunny 1.6 ZX (B12) 86-92. NISSAN Sunny 1.8 (B12) 89-91. NISSAN Sunny 1.8 GTi (N13) 86-92. Hardware and wear leads included where fitted as standard. 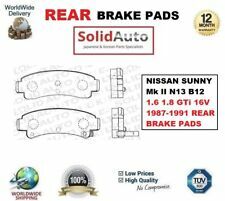 NISSAN 4406015A85, 4406015A87, 4406050A86, 4406058Y86, 4406073A85. NISSAN SUNNY Mk II Coupe (B12) 1.6 GTI 16V Coupe Petrol 05/1987 05/1989 FWD 16 110 81. NISSAN SUNNY Mk II Coupe (B12) 1.8 GTI 16V Coupe Petrol 01/1989 06/1991 FWD 16 125 92. NISSAN 4406015A85, 4406015A87, 4406050A86, 4406058Y86, 4406073A85. NISSAN SUNNY Mk II (N13) 1.6 GTI 16V Saloon Petrol 02/1987 10/1988 FWD 16 110 81. NISSAN SUNNY Mk II Hatchback (N13) 1.6 GTI 16V Hatchback Petrol 06/1987 05/1989 FWD 16 110 81. Part Manufacturer: Apec. Fitting Position: Front Axle. Part Number:PAD379. Listed Part number: PAD379. 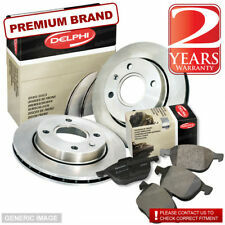 Part Number : DP4665R. 1.6 LX (N13). Yellowstuff is especially appreciated on Trucks for towing and heavy loads and where wheel and tire oversize upgrades have been fitted. There is no guesswork here. NISSAN 100NX 1.6: 91-94. EBC are one of the worlds top brake disc, pads and drum manufacturers with many of the products winning top awards and used in WRC rallying. NISSAN Lucino 1.6: 90-93. NISSAN Sunny 1.4 (N14) : 91-95. Part Number : DP4665R. 1.7 D (N13). Yellowstuff is especially appreciated on Trucks for towing and heavy loads and where wheel and tire oversize upgrades have been fitted. There is no guesswork here. Part Number : DP4665R. Yellowstuff is especially appreciated on Trucks for towing and heavy loads and where wheel and tire oversize upgrades have been fitted. There is no guesswork here. 1.6 LX (B12). Part Number : DP4665R. 1.6 GTI (N13). Yellowstuff is especially appreciated on Trucks for towing and heavy loads and where wheel and tire oversize upgrades have been fitted. There is no guesswork here.